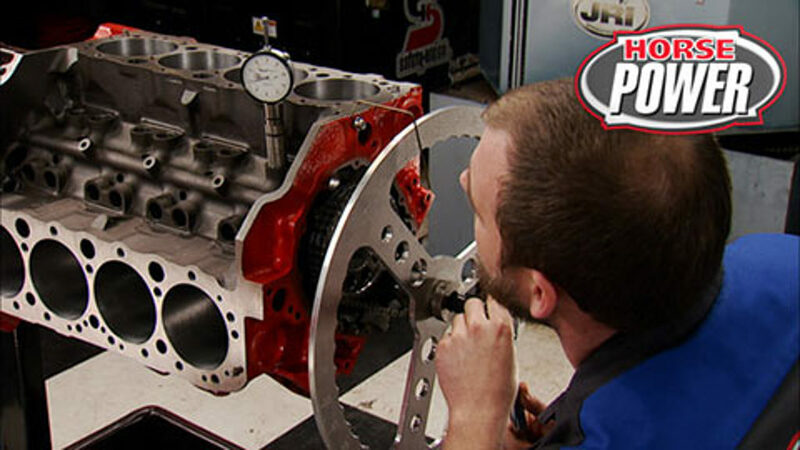 HorsePower's detailed how-to on the preparation and build of a stroker smallblock short block. 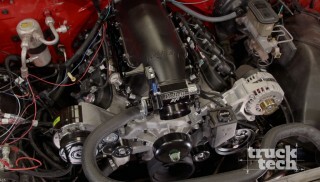 Part two of HorsePower's budget 383 stroker build - the top end. Engine Data Sheet - Download this form which allows you to record component sizes and clearances for your engine project. (ANNOUNCER)>> TODAY ON HORSEPOWER, THE RIGHT WAY TO BLUE PRINT AND BUILD A CHEVY STROKER SMALL BLOCK. WITH COST EFFECTIVE PART SELECTION, DETAILS OF PROFESSIONAL BLOCK PREP, AND SPECIAL TECH TIPS FOR ASSEMBLY. IT'LL BE THE ULTIMATE 383 STROKER, AND IT COULD BE YOURS. (JOE)>> IF YOU OWN ONE OF THE 90 MILLION SMALL BLOCK CHEVYS GM BUILT DURING A PERIOD OF SIX DECADES, YOU BETTER LISTEN UP. WE'RE GONNA SHOW YOU HOW IT'S ACTUALLY POSSIBLE TO BUILD A NEW 383 STROKER IN LESS TIME, BETTER AND CHEAPER THAN YOU COULD BUILD USING THE OLD ENGINE YOU HAVE. (MIKE)>> SO HOW'S THAT POSSIBLE? FIRST BY ELIMINATING ALL THE MACHINE SHOP COST AND TIME BY NOT REUSING ANY OF YOUR OLD PARTS. NOW IT'S A COMBINATION FROM SUMMIT RACING THAT ALL STARTS WITH THIS FULLY MACHINED MAIL ORDER BLOCK WITH FEATURES LIKE A HIGHER NICKEL CONTENT THAT MAKES IT STRONGER. PLUS IT'S A LATE MODEL ROLLER BLOCK WITH A ONE PIECE REAR MAIN SEAL. IT'S GOT THE ALL IMPORTANT FOUR BOLT MAINS AND IT'S ALREADY NOTCHED FOR A STROKER CRANK. THE COSTS, $650 BUCKS. YOU GET INTO THE COSTS. TEAR DOWN WILL BE ABOUT $150 DOLLARS AND YOU'RE GONNA HAVE TO PAY THAT UP FRONT. TO BAKE, SHOT PEEN, AND MAGNAFLUX, THAT'S ANOTHER $50 DOLLARS. FITTING FOUR BOLT MAIN CAPS, $350 DOLLARS, PLUS AT LEAST $100 DOLLARS FOR THE MAIN CAPS. BORING AND PLATE HONING ANOTHER $150 BUCKS. DECKING THE BLOCK, THAT'S $75 DOLLARS. WITH COOLANT FLOW. NOW HERE'S ANOTHER BLUE PRINTING TIP. WHEN THE PISTON IS AT BOTTOM DEAD CENTER, IT ACTUALLY STICKS OUT OF THE CYLINDER BORE JUST A LITTLE BIT. TO AVOID SCORING THE SKIRTS I'M GONNA CAREFULLY BEVEL THE ROUGH EDGES ON BOTH SIDES WITH A CARTRIDGE ROLL WHERE THE SKITS CAN CONTACT THE BOTTOM OF THE BORE. TO INSURE ALL OF THE DEBRIS IS OUT OF THE OIL GALLEY WE'LL REMOVE THE SCREW IN PLUGS IN THE BACK SO WE CAN TAP OUT THE PRESSED IN PLUGS AT THE FRONT. THEN USING THE BRUSH KIT FROM MISTER GASKET WE CAN SCRUB THE GALLEYS TO MAKE SURE THE DEBRIS IS LOOSE BEFORE WE CLEAN THE BLOCK. AND FOR THAT DISH WASHING SOAP AND WATER ARE ALL YOU NEED. BLOW IT DRY WITH COMPRESSED AIR. GALLEY PLUGS AND REPLACE THE PRESS FIT PLUGS. NOW USING SOME OLD TINS AND CARDBOARD WE CAN PAINT THE BLOCK WITH HIGH HEAT CHEVY ORANGE, AND THIS PAINT'S GOOD FOR UP TO 500 DEGREES. (JOE)>> THE 383 STROKER IS A POPULAR COMBINATION GOING BACK TO THE '70'S. THAT'S WHEN GUYS WOULD TAKE A 400 SMALL BLOCK CRANK SHAFT, PUT IT IN THEIR 350 BLOCK, AND INCREASE THE STROKE A LITTLE OVER A QUARTER INCH. THAT COMBINED WITH THE 30 OVER BORE IS WHERE YOU GET THE EXTRA 33 CUBIC INCHES ALONG WITH A LOT MORE TORQUE. ADDITIONAL COATING ON THE SKIRTS TO HELP PREVENT THEM FROM SCUFFING DURING HIGH RPMS. THEY'RE ADVERTISED TO GIVE US A 10 TO ONE COMPRESSION RATIO USING A CYLINDER HEAD WITH A 64cc COMBUSTION CHAMBER. NOW THIS WHOLE ROTATING ASSEMBLY WAS NEUTRALLY BALANCED SO IT CAN BE USED WITH EITHER A MANUAL OR AUTOMATIC TRANSMISSION. THE CRANK AND CAM. SINCE EVERY ENGINE USES PARTS FROM DIFFERENT MANUFACTURERS THIS IS REALLY A MUST. AN ENGINE BLUE PRINTING SHEET YOU CAN PRINT RIGHT OFF OF OUR WEBSITE. NOW IT'S IMPORTANT THAT THE PARTS AND TOOLS BE AT THE SAME ROOM TEMPERATURES. THE FIRST STEP IS TO MIKE THE CRANK SHAFT MAIN JOURNAL OUTSIDE DIAMETER. THEN INSTALL THE BEARINGS DRY AND TORQUE THEM DOWN TO SPEC. WILL TELL YOU YOUR CLEARANCE. TWO AND A HALF THOUSANDTHS, WELL THAT'S PERFECT. NOW IF IT'S A LITTLE TOO TIGHT, LESS THAN TWO THOUSANDTHS, WE'D ACTUALLY TAKE THE CRANK SHAFT TO THE MACHINE SHOP AND HAVE THEM POLISH THE JOURNALS FOR A LITTLE BIT. NOW IF IT'S A LITTLE TOO LOOSE, YOU CAN ACTUALLY GET A SPECIAL SET OF OVERSIZED BEARINGS TO HELP YOU BRING IT RIGHT IN SPEC. ROD BEARING CLEARANCES ARE CHECKED THE EXACT SAME WAY. SINCE OUR BEARINGS ARE WHERE WE WANT THEM, WE CAN TAKE THEM ALL BACK OUT AND NUMBER THEM WITH A SHARPIE MARKER. THIS WILL INSURE THAT THEY GO BACK WHERE THEY WERE CHECKED AT. ALSO LIKE TO GET RID OF THE GAUGE MARKS BY WIPING THEM LIGHTLY WITH NEW GRAY SCOTCH BRITE. WHILE I'M HERE, I ALSO LIKE TO HAND WASH THE NEW PISTONS AND RODS IN CLEAN SOLVENT JUST TO MAKE SURE THEY'RE SMOOTH AND CLEAN. THAT IF ONE WEAR SURFACE WAS THE GAUL OR SEIZE, WELL THERE WOULD STILL BE AN OPERATING PIVOT POINT FOR THE PISTON OR THE ROD TO MOVE ON. NOW I LIKE TO INSTALL THE CAM SHAFT NEXT. YOU'VE GOT A LOT MORE ROOM TO HELP GUIDE IT IN, AND IT'LL KEEP YOU FROM BEATING UP ALL YOUR BEARINGS. WE'RE USING A COMP CAMS HYDRAULIC STREET ROLLER WITH AN OPERATING RANGE OF 2,500 TO 6,000 RPMS. IT'S GOT A 550 THOUSANDTHS INCH LIFT WITH 230 DEGREES OF DURATION AT 50 THOUSANDTHS ON A 110 LOBE SEPARATION ANGLE. NOW THIS IS KNOWN AS WHAT'S CALLED A SINGLE PATTERN CAM SHAFT. (JOE)>> YOU ALL KNOW AN ENGINE IS BASICALLY A BIG AIR PUMP. MORE LIFT LETS IN MORE AIR AND FUEL BY OPENING THE VALVE FURTHER OFF ITS SEAT. ADDING DURATION HOLDS THE VALVE OPEN LONGER TO CREATE A DENSER AIR AND FUEL CHARGE, SO MORE POWER. (JOHN)>> NEXT WE'RE GONNA CHECK OUR CRANK SHAFT END PLAY BY FIRST LUBING UP THE BEARINGS. THEN DROPPING IN OUR CRANK SHAFT, THE MAIN CAPS, TORQUING THEM DOWN TO SPECS. THE BEARING SURFACE. THEN WE CAN FLIP THE BEARING OVER AND WORK THE OTHER SIDE AS WELL. BUT REMEMBER, YOU'RE NOT TRYING TO REMOVE MUCH METAL. JUST DRESSING IT UP A LITTLE FOR MORE CLEARANCE. IF YOU GO TOO FAR YOU'LL HAVE TO GET ANOTHER SET OF BEARINGS. THE THRUST BEARING IS NOW READY TO PERMANENTLY GO BACK INTO THE BLOCK. NOW BE SURE TO USE PLENTY OF ASSEMBLY LUBE BEFORE INSTALLING YOUR CRANK FOR GOOD. NOW ONCE YOU HAVE ALL YOUR MAIN CAPS TORQUED, GO AHEAD AND LOOSEN THE NUMBER FIVE MAIN CAP. THEN TAKE A SMALL, CLEAN SCREW DRIVER AND WORK THE CRANK FRONT TO BACK WITH LIGHT PRESSURE. THE CRANK TOWARDS THE FRONT OF THE ENGINE. 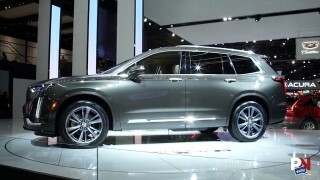 THIS WILL ALIGN THE THRUST BEARING HALVES WHILE YOU TORQUE THE REAR MAIN CAP BACK DOWN. THEN YOU CAN RECHECK YOUR END PLAY. NOW WE'RE AT RIGHT AT SIX THOUSANDTHS, TAKING INTO CONSIDERATION ABOUT TWO TO THREE THOUSANDTHS FOR THAT THICK ASSEMBLY LUBE. WE'RE GONNA BE UPGRADING FROM THIS FACTORY TYPE SINGLE ROW NONROLLER SETUP TO A NICE BILLET DOUBLE ROW TRUE ROLLER TYPE SETUP. NOW THE BENEFITS OF THIS ARE GONNA BE MINIMAL CHAIN STRETCH AS WELL AS MORE ACCURATE CAM TIMING. NOW REMEMBER THIS GEAR'S A PRESS FIT, NOT A HAMMER FIT. THE BOLTS IN HAND TIGHT FOR NOW. WE'VE STILL GOT TO DEGREE THAT CAM SHAFT, AND THAT IS COMING UP NEXT. MATCHING THE OPENING AND CLOSING OF YOUR VALVES. THAT NUMBER DOWN. NEXT ROTATE THE ENGINE THE OPPOSITE DIRECTION UNTIL IT HITS THE PISTON STOP AGAIN AND RECORD THAT NUMBER. NOW ADD BOTH NUMBERS TOGETHER AND DIVIDE THEM BY TWO. NOW WE CAN LOOSEN THE NUT AND ADJUST THE DEGREE WHEEL TO THAT NUMBER YOU CAME UP WITH. RETIGHTEN THE NUT AND ROTATE THE OPPOSITE DIRECTION UNTIL THE PISTON HITS THE STOP ONE MORE TIME. THAT NUMBER WILL BE THE SAME, WHICH VERIFIES WE JUST FOUND TOP DEAD CENTER ON THE DEGREE WHEEL. PROMISE YOU CAN GET IT. (MIKE)>> WE JUST DEGREED THE CAM IN OUR 383 STROKER. TO 15 FOOT POUNDS, INSTALLED THE TIMING COVER, AND THE BALANCER. NOW IT'S TIME TO FILE FIT OUR RINGS. NOW THE RING GAP DEPENDS ON THE TYPE OF THE PISTON AS WELL AS WHAT THE ENGINE IS GONNA BE USED FOR. NOW OUR PISTONS ARE FORGED AND THE ENGINE IS GOING TO BE A NATURALLY ASPIRATED HIGH PERFORMANCE STREET PIECE. THE TOP RINGS SHOULD HAVE AT LEAST FIVE THOUSANDTHS GAP PER INCH OF BORE, MAKING OUR TOP RING RIGHT AT 20 THOUSANDTHS GAP. NOW THE SECOND RING WILL BE SLIGHTLY SMALLER WITH ABOUT 18. FIRST PLACE THE RING IN THE BORE AND SQUARE IT UP. NOW CHECK THE GAP WITH THE FEELER GAUGE. THEN USING A RING FILER SLOWLY GRIND MATERIAL AWAY EVENLY FROM BOTH SIDES. NOW MAKE SURE YOU DON'T LEAVE TOO MUCH. HEAT WILL EXPAND THE PISTON, AND IF THE GAP IS TOO TIGHT YOU'LL DAMAGE IT. THE STAINLESS STEEL OIL RINGS ARE LESS CRITICAL. JUST MAKE SURE HAVE AT LEAST 15 THOUSANDTHS OF END GAP. WITH THE OIL EXPANDER AND SCRAPERS IN PLACE WE CAN PUT ON THE SECOND RING AND FINISH OFF WITH THE TOP RING. LIGHTLY OIL THE PISTONS, RINGS, AND THE SKIRTS, AND STAGGER ALL THE RING GAPS SO THEY ARE NOT ALIGNED. THEN USE A RING COMPRESSOR AND GUIDE THEM HOME. WITH PLENTY OF LUBE ON THE BEARINGS, MATE THE CAPS AND TORQUE THE ARP BOLTS TO 40 FOOT POUNDS. (JOHN)>> THE FINAL STEPS TO BUTTONING UP OUR SHORT BLOCK IS GONNA BE TO GET STARTED WITH THAT REAR MAIN SEAL. NOW REMEMBER OURS IS A ONE PIECE AS OPPOSED TO ONE OF THOSE OLD TWO PIECES THAT GENERALLY LEAKS. WITH THE SEAL LUBED WE CAN INSTALL THE ASSEMBLY AND BOLT IT TO THE BLOCK. (JOE)>> WELL NEXT WE'RE GONNA CHECK OUR OIL PAN TO PICK UP CLEARANCE. IT STARTS WITH THE GASKET. THEN WE DROP IN OUR HIGH FLOW OIL PUMP AND PICK UP, SECURE IT FINGER TIGHT. THE TARGET IS BETWEEN A QUARTER INCH AND THREEEIGHTHS, AND WE FIRST MEASURE FROM THE PAN RAIL TO THE PICK UP FACE. TOP END BEFORE DYNO'ING OUR 383 STREET STROKER.